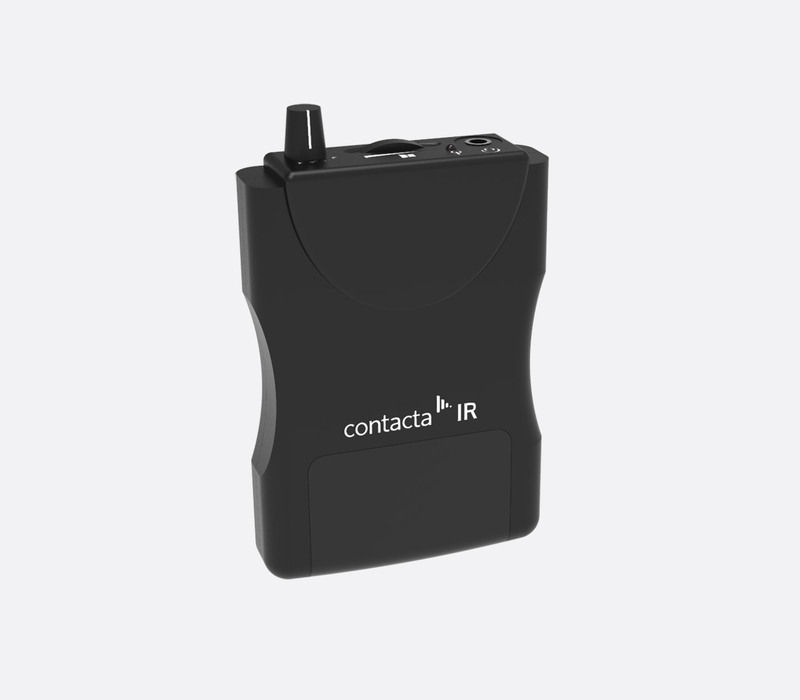 Contacta IR (infrared) listening systems use assistive technology to provide accessibility to those who require listening aid. 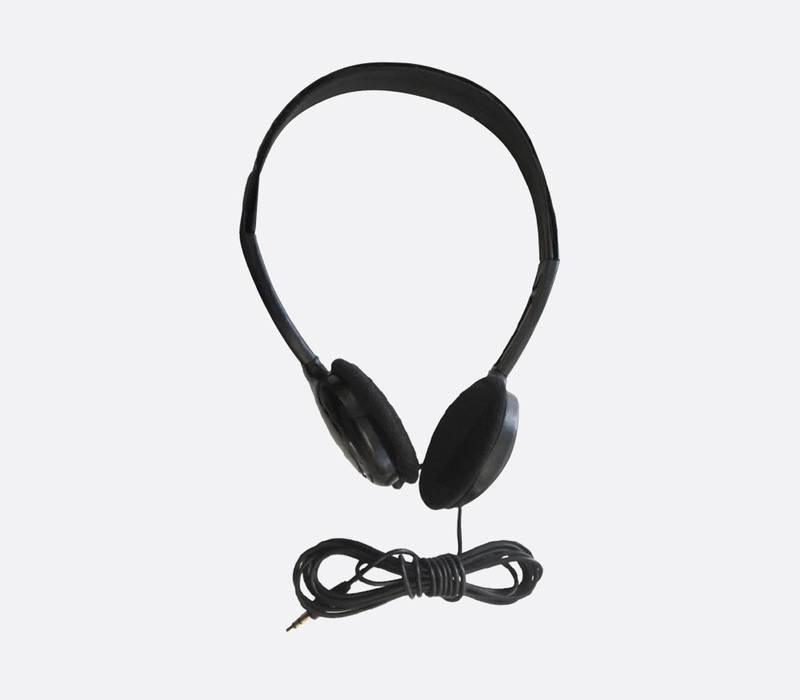 Designed to be used when a user requires a sound source to be transmitted to multiple portable receivers in an environment where ambient noise needs reducing. Designed for conference and meeting rooms, cinemas, theatres, courts or places of worship, The IR-TX2 can cater for areas up to 180m2. It combines an infrared modulator with transmitter, modulating audio signals to infrared signals at 2.3MHz or 2.8MHz selectable. The RCA (phono) line level inputs positioned on the rear facing panel can be used for ‘left and right and/or A and B-channel’. A microphone input is also provided by way of 3.5mm jack socket. A rotary controller can be used to adjust the input sensitivity of the microphone input channel. Using the ‘sync out’ and ‘sync in’ connections, two IR-RX2 transmitters can be combined to increase the range to 370m2, whilst increasing the projection angle. 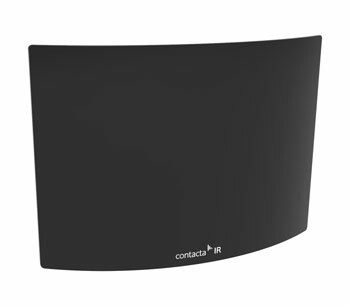 Can be wall or ceiling mounted by utilising the included wall/ceiling mount kit. Power requirement: 100-240V AC, 50-60Hz. Transmission power: 0.7W. Coverage area: 180m2. Mic input: 3.5mm jack socket. Line input: Dual RCA (phono). Dimensions (H x W x D): 64 x 254 x 79mm. Weight: 300g. This infrared transmitter and modulator combination is housed in a ‘sleek and compact’ wall or ceiling mountable unit. Designed to cater for larger, closed room areas of up to 900m2, such as schools or universities, cinemas or theatres. 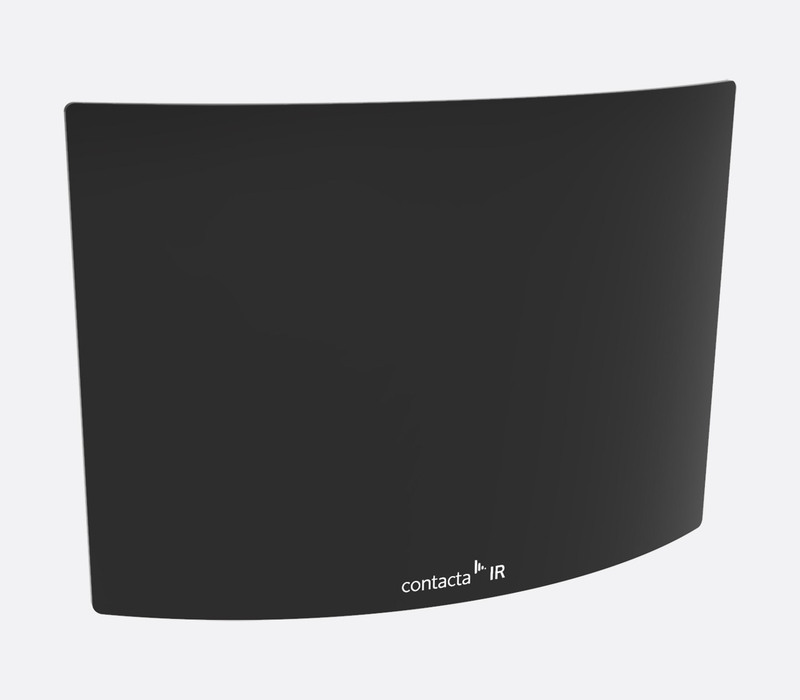 It has a selectable bandwidth of 2.3MHz or 2.8MHz and additional IR-TX4 transmitters can be added to increase the coverage. The rear panel of the transmitter has 1.3kohm line level RCA (phono) inputs for left and right ‘and/or A and B-channel’ operation. These inputs have a trigger voltage of 110mV, whilst a microphone input is provided by way of 6.3mm, 18kohm jack socket. Includes wall or ceiling mounting kit. Power requirement: 230V AC, 50-60Hz. Consumption: 700mA. Coverage area: 900m2. Mic input: 18kohm, 6.3mm jack socket. Line input: Dual 1.3kohm RCA (phono). Dimensions (H x W x D): 327 x 412 x 75mm. Weight: 1.1kg. The IR-RXU underchin infrared receiver operates on 2.3MHz or 2.8MHz bandwidths and has been designed as an all-in-one receiver with fixed earphones that can be adjusted up to 120dB. 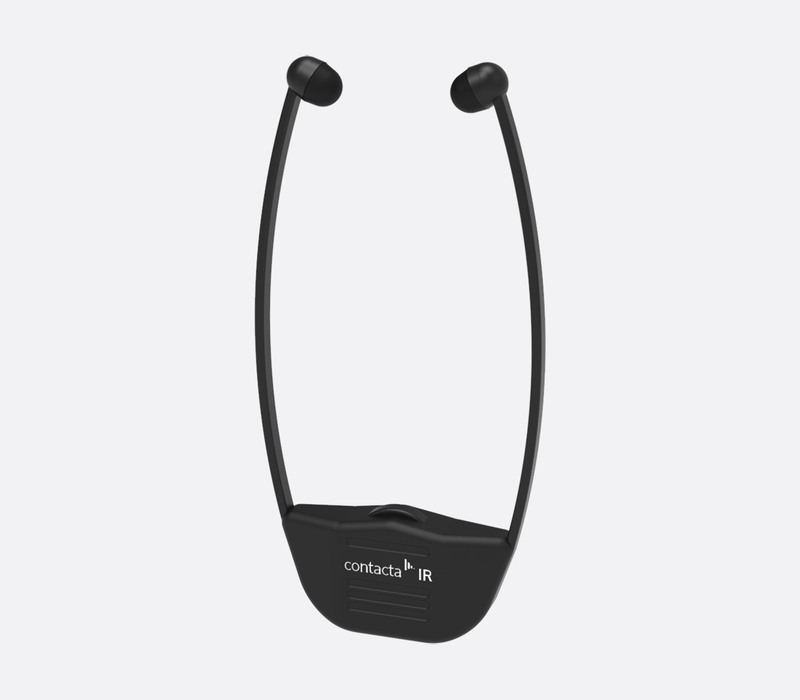 The receiver can be setup to provide mono or stereo audio with replacement earbuds available as an optional addition. 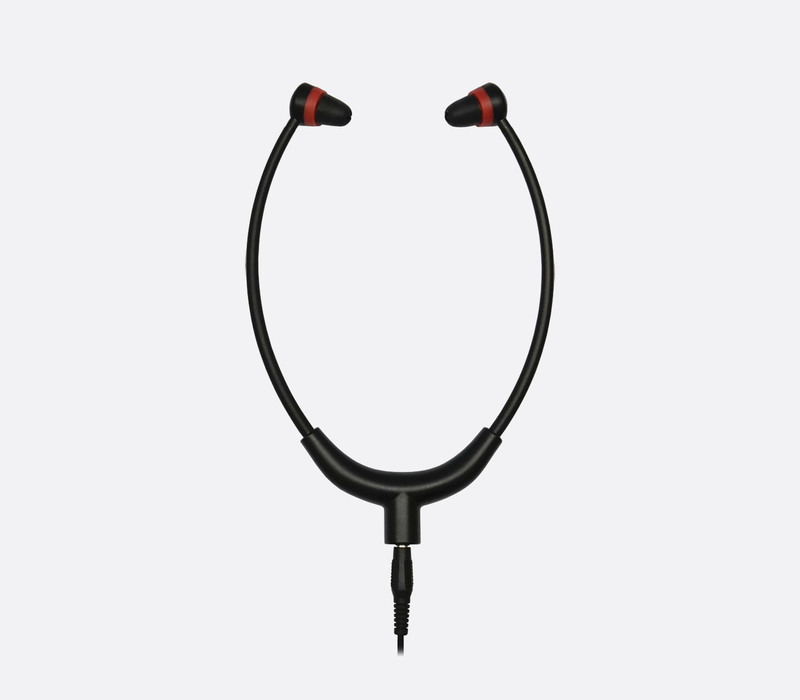 The earpieces are designed to swivel, retaining position and giving a more comfortable fit when a user turn their head position. A single A100, rechargeable NiMH battery is provided and can be charged in situ using the optional IR-RXU-DC5 5-bay charging dock. Included accessories: A100 NiMH rechargeable battery, transparent cover. Frequency response: 15Hz – 20kHz. Distortion: less than 1%. Signal to noise ratio: 60dB, typical. Dimensions (H x W x D): 225 x 95 x 19mm. Weight: 57g. This four channel portable infrared receiver operates on 2.3MHz, 2.8MHz, 3.3MHz and 3.8MHz and is compatible with the IR-TX2 and IR-TX4 transmitters operating on 2.3MHz or 2.8MHz. The inbuilt automatic gain control adjusts the incoming infrared signals to optimise the audio signal available to the user. 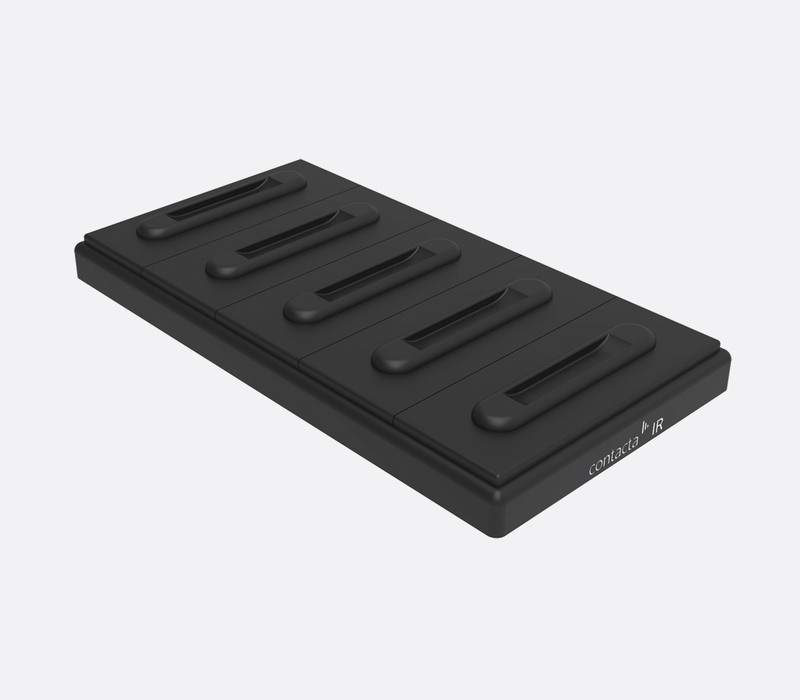 The two AAA cell batteries (included) allow up to 20 hours usage and can be charged in situ by using the optional IR-RX2-DC5 5-bay charging dock. A rotary control on the upper edge of the beltpack receiver allows volume adjustment for the 3.5mm jack socket headphone output. Included accessories: Lanyard with clip, belt clip, 2x rechargeable AAA battery cells. Frequency response: 60Hz – 12kHz, +/-3dB. Signal to noise ratio: 54dB, not weighted. Dimensions (H x W x D): 112 x 70 x 22mm. Weight: 200g. 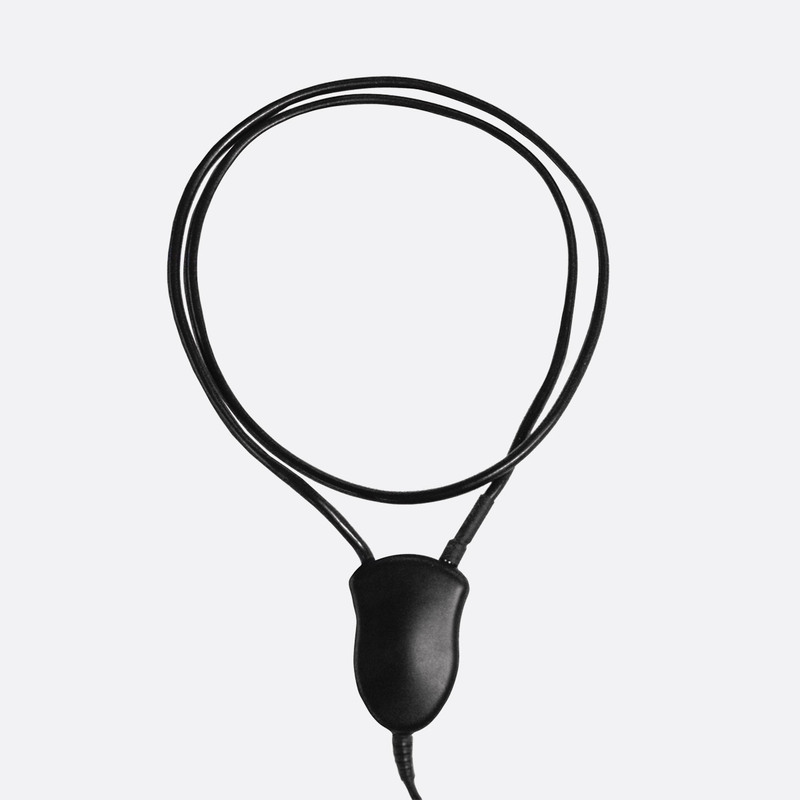 This inductive neck loop is designed for use with the IR-RX2 receiver and users with hearing instrument switched to the “T” (telecoil) position. The listener will then be able to hear via their own earpieces. Impedance: 16ohms. Channel: 1KHz/isolated. Connector: 3.5mm jack plug. Maximum input power: 0.5watts per channel. Dimensions (H x W x D): 420 x 3.3 x 10mm. Cable length: 1m. Weight: 49g.